*Street Race Pads ('R' Compound Code)* While the High Performance Street/Race pad is ideal for many aggressive drivers that own high performance street cars, it does produce a bit of noise and dust. * Aggressive Torque * Great Rotor and Pad Wear Life * 100-1200°F Operating Temperatures * Smooth and Predictable Control * Designed to Deliver High Deceleration Rates * Smooth Braking Feel * Consistent Brake Release Characteristics *High Performance Street 5.0 ('B' Compound Code)* The new High Performance Street 5.0 Pads are a Ferro-Carbon compound brake pads that provide advanced braking characteristics to enhance the driving experience. This new compound combines the safety and quality of aerospace design partnered with the braking technology of motorsports, the results are shorter stopping distances, improved performance under heavy braking conditions and street car friendly characteristics. * Pushing the Limits of ABS * Decreased stopping distances * Improved pedal feel from initial pressure through entire pedal stroke * Minimal fade under Higher Temps * High friction/torque hot or cold * Gentle on rotors * Very quiet, low noise * Improved braking over OE pads * Extended pad life *HPS ('F' Compound Code)* When it comes to performance braking, there is no competition. This unique Ferro-Carbon compound combines the safety and quality of Aerospace design partnered with the braking technology of motorsports. Much improved braking over OE and standard replacement brake pads. Recommended for import & domestic automobiles. 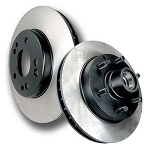 * Increased Stopping Power * High Friction/Torque Hot or Cold * Gentle on Rotors * Extended Pad Life * Low Dust * Virtually Noise-Free *Performance Ceramic ('Z' Compound Code)* Performance Ceramic is engineered to reduce brake NVH (Noise, Vibration and Harshness) creating a quieter performing brake pad. Furthermore, the ceramic brake pad formula has a linear friction profile that allows your ABS brake system to work more effectively. With Performance Ceramic you can expect reduced brake pad wear, lower dust output levels and a rotor-friendly brake pad. * Increased Stopping Power * Increased Rotor Life * Extended Pad Life * Ultra-Low Dust * Extremely Quiet * Stable Friction Output *HP Plus ('N' Compound Code)* HP Plus utilizes a unique Ferro-Carbon, high-tech friction material that was developed and manufactured for sport driving in autocross, Solo II and “track day” applications. The Ferro-Carbon formulation offers lower wear rates and higher torque values than other competitive materials. Extremely high coefficient of friction makes HP Plus the perfect upgrade over stock for high performance streetcars used in autocross competition or that experience repetitive, heavy braking. 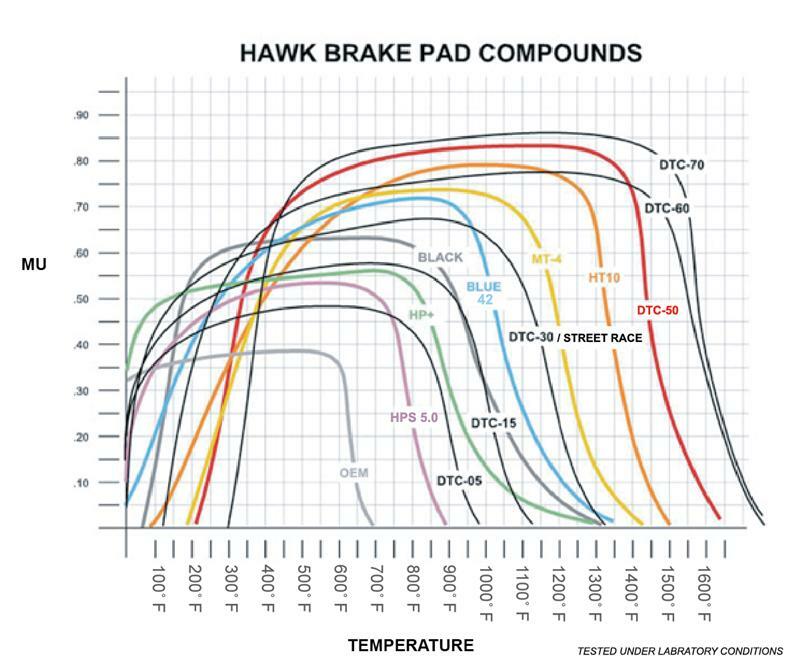 * Extremely High Friction Output * Fade Resistant * Worthy for Autocross & Club Racing Events *Note:* Hawk Performance burnishes its HP Plus brake pads as a final step in the factory, but all brake pads have to be bedded-in with the rotors (new or used) that they will be used against. Properly bedding-in new brake pads results in a transfer film being generated at the pad and rotor interface to maximize brake performance. 177 points will be rewarded to you when you buy this item.